So...here I was at a park at 5pm yesterday and I was teaching a co-worker how to shoot pictures with her DSLR. And damn it was hot! I was explaining the concept of shooting with a fast shutter speed in order to get a clear shot and also mentioned that there are times when you want to use a slow shutter speed. She looked at me and said "When would you want to do that?" 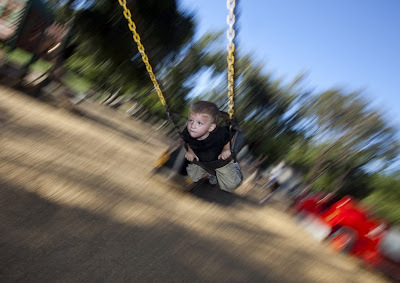 So I set the camera for 1/25 of a second and went over to the swings in the park (asking the parents first) to shoot some pictures of a little boy having a great time swingin' high. I took a couple of shots and knew that I needed a flash to do it right, so I ran back to my car, grabbed my 580EX II flash and got this shot. I love the motion blur in the background with the boy crystal clear in the shot. Too bad he didn't have that huge smile on his face when I grabbed this one! First I shot my sister - Now I shot my niece!